This article provides you the revision notes on Class 12 Chemistry: Chapter- Amines, to give you a quick glance of the chapter. These quick notes are prepared strictly according to the latest CBSE syllabus for Class 12th Chemistry. Nitrogen atom of amines carries an unshared pair of electrons and is sp3 hybridised with pyramidal shape. Due to the presence of unshared pair of electrons, the angle C–N–E, (where E is C or H) is less than 109.5°. In aromatic amines, the C‒N bond is slightly stronger due to the partial double bond character which arises as a result of delocalisation of lone pair of N with the benzene ring. 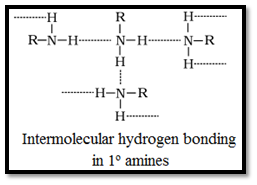 • 1° amine: One hydrogen atom of NH3 is replaced by an alkyl or aryl group. • 2° amine: Two hydrogen atoms of NH3 are replaced by alkyl or aryl groups. • 3° amine: All three hydrogen atoms of NH3 are replaced by alkyl or aryl groups. • Aliphatic amines are named by prefixing an alkyl group to a mine, i.e., alkylamine. • Secondary and tertiary amines, having two or more similar groups are named by adding prefix ‘di’ or ‘tri’ before the name of alkyl group. • Aromatic amines are named as derivatives of the parent member, aniline (C6H5NH2). • Aliphatic or aromatic amines are named by replacing ‘e’ in the end of the parent hydrocarbon by ‘amine’. • Amines containing more than one amino groups at different positions in the parent chain, are named by specifying numbers to the carbon atoms bearing –NH2 groups along with attaching a suitable prefix such as di, tri, etc. to the amine. The ending ‘e’ of the hydrocarbon is retained. • The lower aliphatic amines are gases with fishy smell. • Primary amines wit three or more carbon atoms are liquid and higher members are all solids. • Lower amines are soluble in water as they can form hydrogen bonds with water, however the solubility decreases with increase in hydrophobic alkyl group. • Amines have a higher boiling point than the hydrocarbon of comparable molecular mass. This is due to their ability to associate via intermolecular hydrogen bonding. 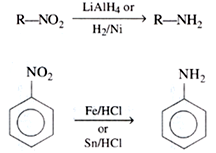 Amines act as Lewis bases due to the presence of lone pair of electrons on the nitrogen atom. 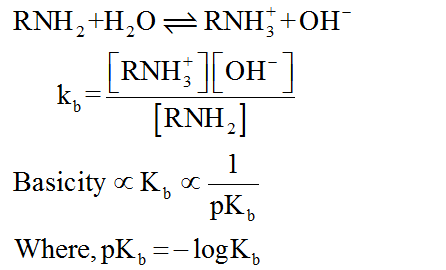 Basic character of amines can be better expressed in terms of their Kb and pKb values.